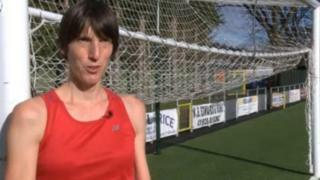 A fell-running champion has admitted stabbing three top athletics staff at a major UK stadium. Lauren Jeska, 42, admitted attempting to murder former Bristol rugby player Ralph Knibbs at the Alexander Stadium in Birmingham on 22 March. She also pleaded guilty to causing actual bodily harm to Kevan Taylor and Tim Begley, who tried to intervene, and two counts of possessing a knife. Jeska, of Powys, will be sentenced at Birmingham Crown Court on 15 November. In a statement, the Crown Prosecution Service said Jeska had been in a disagreement with athletics officials and it "escalated". She drove from her home in Wales to the stadium in Perry Barr, where she asked to speak to Mr Knibbs. After being told to wait in reception, she walked into the open plan office and launched her "premeditated" attack. Police said Mr Knibbs suffered life-threatening injuries after being stabbed in the head and neck, and is still recovering. Jeska was England's champion fell-runner three times between 2010-12, and has been a member of Todmorden Harriers, Aberystwyth Athletics Club and another club based in Snowdonia. Mr Knibbs, the former Bristol RFC centre and head of human resources and welfare at UK Athletics, was in court to hear Jeska enter her pleas via video link from HMP Foston Hall in Derbyshire. The former rugby star played 436 times for Bristol RFC, scoring 123 tries during a career spanning the 1980s and 1990s. The court heard the injuries of Jeska's other victims - accountant Mr Begley and finance director Mr Taylor - were "not of the most serious order". Prosecutor Timothy Atkins QC said not guilty pleas to charges of wounding were acceptable to the Crown. "I have had the opportunity of consulting those who instruct me and they have spoken with the complainants in this matter," he said. "During the course of the attack (on Mr Knibbs), Mr Taylor and Mr Begley went to his assistance and both were injured. "Thankfully their injuries were not of the most serious order and so the pleas to wounding are acceptable to the Crown given the pleas that have been entered." Although Jeska admitted possessing two kitchen knives, she denied possessing a bread knife which had been left in a bag before the attack on 51-year-old Mr Knibbs. Judge Philip Parker QC was told Jeska, of Wesley Terrace in Machynlleth, had been the subject of psychiatric assessment but further reports would be necessary before she is sentenced. Defending, Julie Warburton said a diagnosis of autism may be raised at the next hearing, which would be invited to consider whether a "medical disposal" would be available to the sentencing judge. She was remanded in custody. In a statement, UK Athletics said it wanted to thank "staff who reacted quickly in restraining the individual concerned, putting themselves at risk". It also issued thanks "to staff who worked calmly and yet with urgency to apply what was life-saving first aid to Mr Knibbs", and everyone who assisted with the investigation.